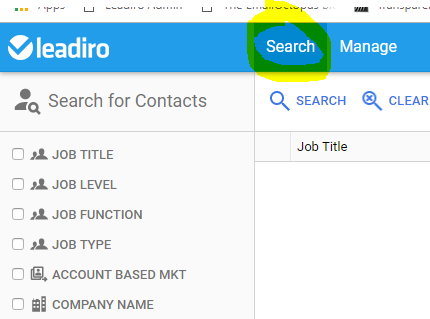 Searching Contacts - You search for contacts in Leadiro by clicking on the 'Search' tab on the top blue bar. You run your searches based on relevant search parameters from the left hand side of the screen. Note: You do not need to use every search filter when searching, simply use the ones you need. Exporting Contacts - Once you run your searches (examples below) you need to tick the boxes beside the contacts that display in the main view. Then when you have selected what you need you hit the 'CHECKOUT' button (top right hand side of screen) to export the full contact details from your cart to reveal names, phone numbers, email id etc. ADD MANY - you can select x number of records per company using this option and set your export limit. So for example, if you wanted your export to be 500 contacts and you just wanted 1 contact per company you can do that by clicking this button. Simply key in as many job title keywords that are relevant to your target audience in the 'job title' field. 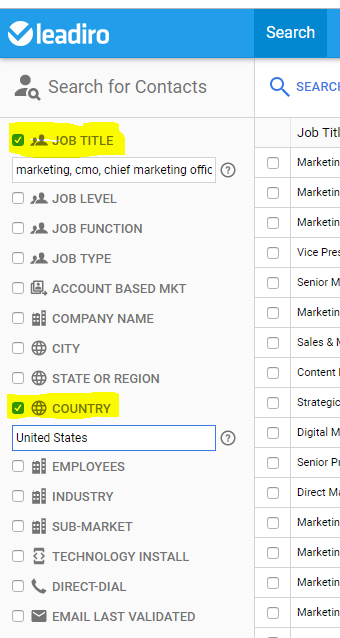 In the example below we put marketing, cmo, chief marketing officer and then select 'United States' in the country search. Note: If you don't want to search by job titles, you can search just by 'job function' 'marketing' and select contacts based on 'job level'. 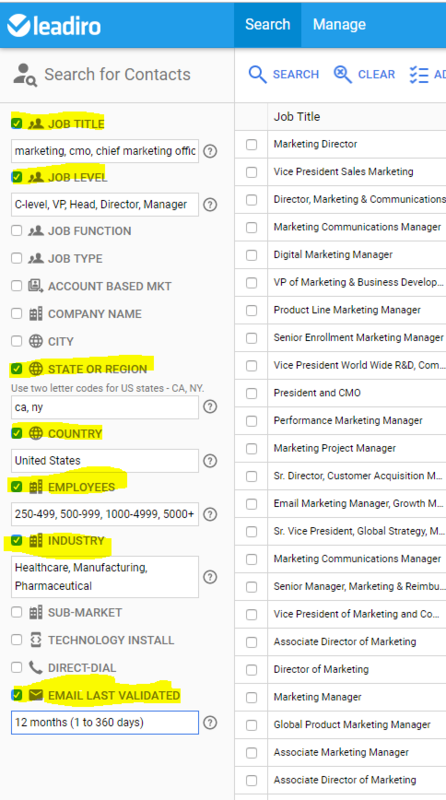 Example 2 (more specific search) - Searching marketing contacts in certain states in the U.S within specific industries and organisation sizes. Two or more words together - "Software Engineer" will find results that contain ALL of those words. Separate words with a comma - "CEO, CFO" will find results that contain EITHER of those words. Excluding words from searches - "CEO -PA -EA -Assistant"
Exact Match Searches - A search for the "Human Resources Manager" included in quotes will return job titles that exactly match that phrase. "Human Resources Manager" OR "HR Manager" will also work. 'INDUSTRY' is the standard industry classifications. 'SUB-MARKET' is a more granular breakdown of industries. If your target audience is covered in the 'INDUSTRY' field search then just use that field. If you need to get more specific in terms of your target industry then search based on 'SUB-MARKET' only. Pick from searches offer a set of values to choose from. Multiple options checked - will find results that contain EITHER of the options. Changing to Exclude - will find results that DO NOT contain ANY of the options. The total number of contacts that match your search. The number of unique companies that those contacts are at. You can clear the current search and start again by clicking the Clear button. You can do this with the Saved Searches feature.